Etisalat has finally decided to join the race. I wander what they have been doing while MTN and Glo have been busy scooping away all their customers with their irresistible offers. With the all telecommunication competition craze going on, Etisalat has also decided to revisit it's own data plans and they are slashing down the prices of their data plans as well. So for all those who haven't been benefiting from the all MTN data slash probably due to poor network service in your area or you just happen to be a core etisalat user then this is for you. Below are their list of available data plans and their new prices. They are all valid for one month. 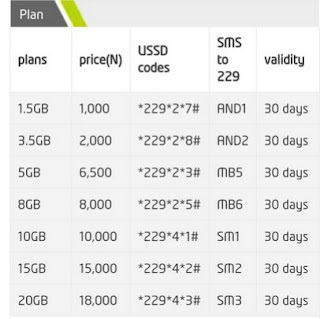 As I said earlier, this is valid for one month and it works for all etisalat users. So guys what do you think about this new price. Do you think it's good enough or you believe they still have more work to do.